Vanadium is a chemical element wi the seembol V an atomic nummer 23. It is a haird, sillery gray, ductile an malleable transeetion metal. 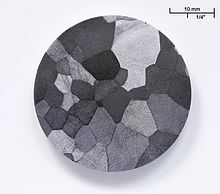 The element is foond anly in chemically combined furm in naitur, but ance isolatit airtifeecially, the formation o an oxide layer stabilizes the free metal somewhit against further oxidation.